Sleep apnea is a serious disorder where a person temporarily stops breathing throughout the night for short periods of time. 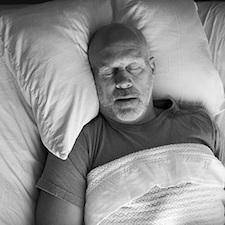 This prevents a person from completely falling asleep, and it can also raise their blood pressure to dangerous levels. At Cityview Dental Arts, Dr. Jerry Bock can provide relief from these symptoms as your sleep apnea dentist. Treatment will consist of a custom-made oral appliance that slightly repositions the jaw, and the end result will be an open airway, a full night’s rest, and an energized morning! Sleep apnea is typically caused by the soft tissues in the mouth and throat relaxing into and blocking a person’s airway. When air passes by this obstruction, it can cause these tissues to vibrate, which creates the “iconic” snoring sound. Loud, chronic snoring is one of the most common signs of sleep apnea, but even for a person without this condition, snoring can indicate that they aren’t getting the restful sleep they need (which is probably true for their bed partner as well). If you need help to stop snoring, Dr. Bock can provide you with a custom-made oral appliance that will prevent this blockage so everyone can sleep soundly once again. If you or your partner snores, or if you need to get treatment for your sleep apnea, you can get relief from an unexpected place: your dentist! Dr. Bock has helped hundreds of patients get the rest they need with oral appliances, and he can do the same for you. If you’re ready to feel great in the morning again, please contact us today for an appointment.